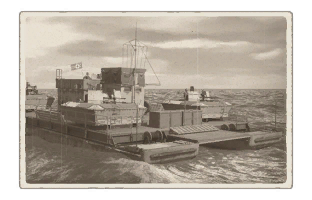 The Siebelfähre 40 Leichte Flakkampffähre is a Rank II German anti-air ferry with a battle rating of 2.7 (AB/RB/SB). 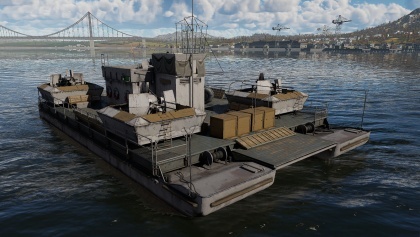 It was introduced in Update 1.79 "Project X" in the fleet closed beta test. Talk about the vehicle’s armor. Note the most well-defended and most vulnerable zones, e.g. the ammo magazine. Evaluate the composition of components and assemblies responsible for movement and maneuverability. Evaluate the survivability of the primary and secondary armament separately. Don't forget to mention the size of the crew, which plays an important role in fleet mechanics. Tips for preserving survivability should be saved for the “Use in battle” section. If necessary, use a graphic template to show the most well-protected or most vulnerable points in the armor. The 4 x 20 mm Vierlingsflak C/38 cannons are the star of this ship, capable of shredding apart any type of ship, at least at low rank. The ammo doesn't really matter as there is an abundant reserve for mass firings. The 37 mm is rather useless compared to the primary armament due to its limited armaments, but can be used to peg weak ships at a distance and pester off incoming aircraft. The best method of using the SF40 Leichte is to hide behind a rock near the capture points and rake anything that tries to cap with the large assortment of autocannons. It is also possible to flank around, get to the sides of the enemy and riddle them with cannon ammo as well. Large target from any angle. Placement of the flakvierlings mean that at most 3 of them can fire at the same surface target.